A sad pond story with a happy ending for some ducks! This is what our pond looks like now. I was so upset about this I couldn’t even photograph it! Finally…….now that the ending is written……I could. This was two months ago. 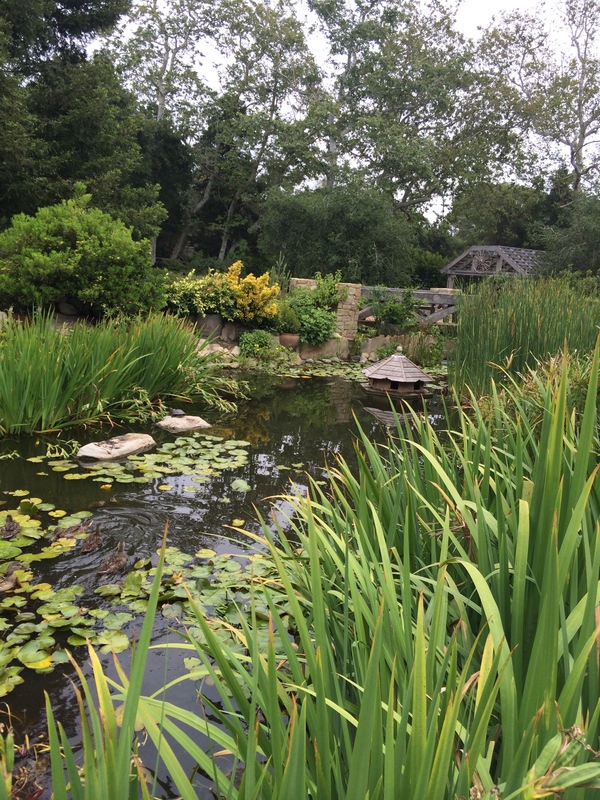 This is what our pond looked like a few months ago! by 60%. When we dug this pond 17 years ago; it filled up with water! However, because of the drought, the water table has fallen. is in the middle (slightly lighter); and she is talking to me! This year……different story altogether..and I didn’t see it coming!!! When the pond started going down precipitously ; I was beside myself!! We ordered 6 thousand gallons of water trucked in by tanker. It lasted 4 days! My friend Radisha suggested that I buy “wolf pee”! And apply a ring of it around the pond! I did!!! It is collected at zoos and sanctuaries; and the wolf pee is the one every animal is afraid of! who knows what would prey on these ducklings! Hysteria set in!! Sobbing…..it was bad. It was so scary and terrible. I feel so responsible for these ducklings! We had to leave for the east coast in the middle of this emergency! We left at 3 am on a Monday…….I was catatonic. This mother duck. She is the heroine of this story. To my friend Lynn Conrad’s pond. My friend has the exact duck house. (I ordered it for her)! She called me to tell me a neighbor had called about 7 pm and said,”Open your Gate!! She did and in they came! Here are “our” ducklings in her pond! across the nature preserve……down the middle of our lane….up our driveway and into our pond! they came running! Peeping like mad!! They recognized my voice! and the mother did too!! It was truly a peak experience! Thank the Lord these ducks were so lucky to have such a smart mother! YIKES!! I am so happy they are safe! They love the architecture of their duck house! The mother is talking to me!! They all flew about 10 days after this picture was taken! Now. My job is to figure out how to get the “heart of the garden” back! by evaporation…..which is very little! We have to fill it (once it is lined) with water brought by tanker (we know and love those people)! And the frogs (and I pray the turtles) will come back……and by the Spring..
the duck houses will be floating again. My dream will come true!! and their ducklings will be safe again! with the pond and the duck house! Quick duckling progress story!!! First ducklings of the Spring! This picture is right after they hatched!! All 11 ducklings have survived; in 10 more days they will be able to fly!! They are a little hard to distinguish from their Mommy! HAVE A WONDERFUL HOLIDAY WEEKEND!!! AND PLEASE ENJOY WILDLIFE AND THE OUTDOORS! (it is very tempting) However, I do not want them ever to be vulnerable to people who do not want to “help them”; and who want “eat them”! 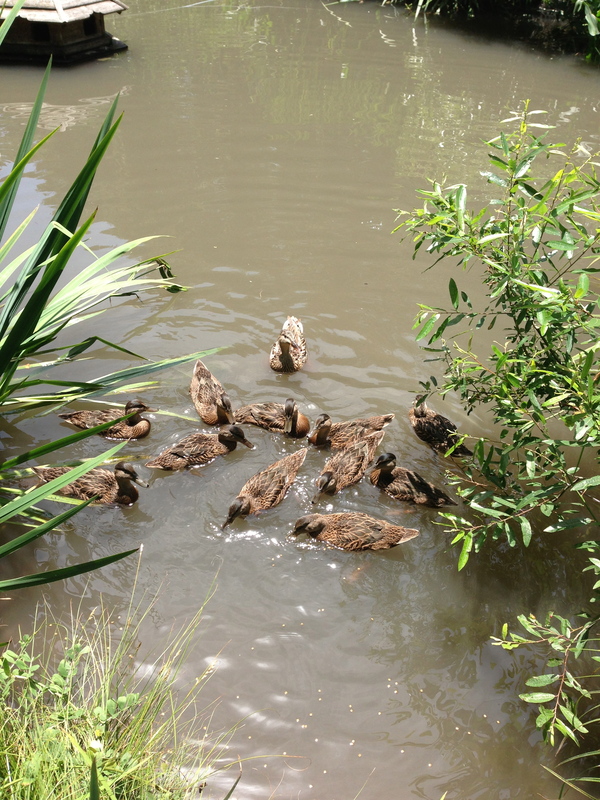 Lots of ducks do fly to our pond……..(they do fly to where they “hatch”!Last January……..65! They are welcome!! I live in heaven……and I haven’t even died yet!!! thank you for following me! I am astonished!! !